The National Centre for Australian Children's Literature (NCACL) has been very busy over the last eight months, producing a series of events to celebrate UNESCO's International Year of Translations. 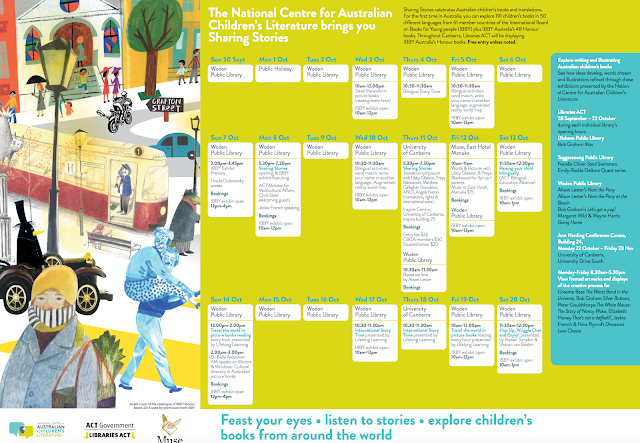 Sharing Stories celebrates Australian children’s books and translations. For the first time in Australia, you can explore 191 children’s books in 50 different languages from 61 member countries of the International Board on Books for Young people (IBBY) plus IBBY Australia’s 48 Honour books. Throughout Canberra, Libraries ACT will be displaying IBBY Australia’s Honour books. Speakers include children's book luminaries such as Libby Gleeson, Ursula Dubosarsky, Jackie French and Freya Blackwood. Click the poster above to see the entire calendar, and click HERE for more details on the program events. Not to be missed!